It was high noon. The heat was on. Marcia stared straight into the eyes of her opponent and she knew, she just knew. He had the gold. If we leave the drama behind for a second, Marcia will probably admit that her jackpot win was a total fluke. She didn’t know this Play’n GO slot would pay out. She’d never even seen the game before. But there was something about it that caught her eye when she loaded the Vera and John mobile casino. Maybe, and we are guessing here, it might have something to do with the progressive local jackpot slowly climbing up and up, ready to burst for one intrepid gunslinger? Out in October 2018, this is technically a relatively new game. “I confess that I didn’t know the game. 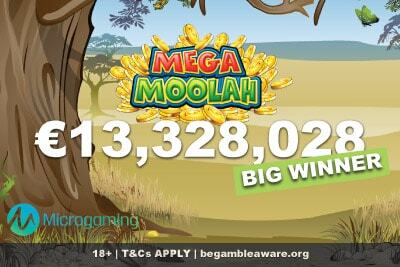 I took a look at the site, saw that the game had jackpot potential and decided to try my luck there” Marcia told us. We say relatively because there did exist, for many years, a Gunslinger slot by Play’n GO which then got replaced by this Gunslinger Reloaded mobile game. Why? Because sometimes you need to put a little spit and shine to make something sparkle again. Clearly, it sparkled nicely enough to catch Marcia’s eye. Marcia hit the £106,466 local Play’n GO jackpot in 2 spins! This is a local progressive jackpot slot. Meaning that the pot builds up as players at that specific casino play. So if you play this Gunslinger Reloaded at Casumo casino, for example, it could have a different amount because the Casumo players may play it more or less. 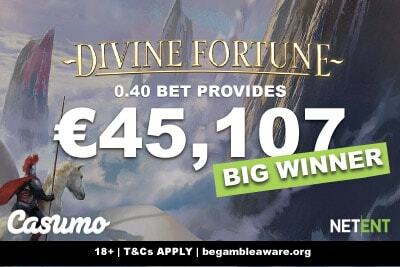 It’s a little like the Divine Fortune slot by NetEnt rather than the more famous Mega Fortune game. Needless to say, these kinds of local progressive jackpots don’t tend to pay out 13 million like Mega Moolah. So sure, the wins aren’t life-changing. But instead of creating 5 millionaires a year, a slot like this pay about 50 to 100k a month, so you have more winners. 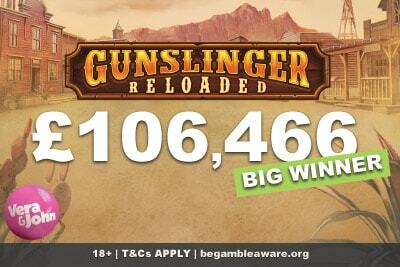 How do you win the Gunslinger Reloaded jackpot? Well, for one, it’s actually not that easy. If it was, the amount you could win would be a lot less than a cool 100 thousand in cash. But what basically happened for Marcia was that she collected 5 poker cards on a winning payline in the base game of the Gunslinger Reloaded online slot. At this point she shot down the cards, waiting to see what cash prizes she would have won. Because usually, that’s what would happen to pretty much everyone. Except on this occasion, she found 5 stars behind the cards, with those stars making her Sheriff of this old town and winner of the big jackpot prize. Is the Gunslinger Reloaded slot any good? Marcia took the whole of 2 spins and won the jackpot. She didn’t spin much more after that, because she’s a smart girl and when you have 100k in the bank, you click withdrawal as soon as possible. But if she has a chance to return, she will find a fun easy playing low variance game with multiple bonus features. This is a Wild West-themed slot with more than just a progressive jackpot. You’ll also find re-triggerable Bottle Free Spins where all wins are doubled, bounty hunts and an intense shoot-out feature. But, if we are honest, the big slot wins are by catching that progressive. It seeds at 1,000 in cash and the higher you bet the better your chances of triggering the jackpot prize. Marcia is heading to the wild wild… Paradise? A win of £106,466 is enough to change your year, maybe even your life style, but probably not enough to quit your job. It came just at the right time. Because this lady is clearly smart enough to know when to press the withdraw button, but also smart enough to know a smart investment. Which is why the bulk of the cash is going toward a new business idea she’s been working on. Who knows, maybe next time we hear about her, she’ll be the CEO of the next travel space station holiday Inc. But before all of that, she’s already bought herself a ticket to a faraway paradise Island where she can relish in her new life and future. We don’t know which Island. Maybe Mauritius. Perhaps Tahiti. Perhaps she’ll be heading to the Virgin Islands, keeping an eye for any real estate for when she’s as rich as Richard Branson? Who knows. But it sounds like the perfect way to spend that kind of win. We hope you enjoy every last penny Marcia. Could you be the next big Vera and John winner? As we write in our Vera and John casino review, this is one site that loves to celebrate winners. 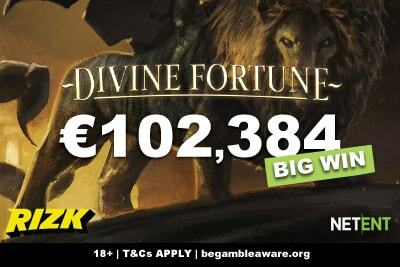 They have a guarantee that one player will always walk away with at £€$5,000 in big wins a day, or £€$50,000 in big wins a month (or they top up the nearest winner). It’s these kinds of promises that makes them stand out from the pack and the fact that they have one of the largest and best collections of casino phone games around. They have 24/7 customer service, fully licensed in all major markets, from UK, to Sweden, Europe and Denmark, you couldn’t find a better casino to play. Take the welcome bonus, get playing, and soon enough you’ll be wondering why you ever played anywhere else.